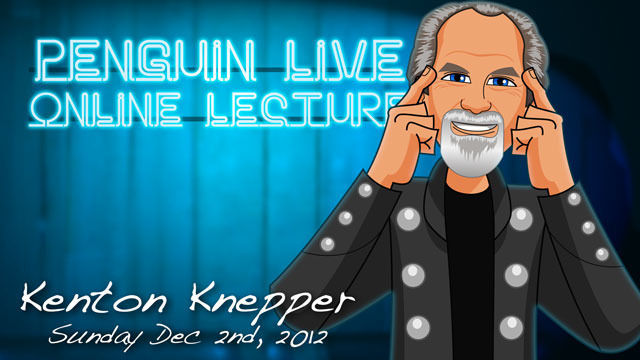 Today, when you order "Kenton Knepper LIVE", you'll instantly be emailed a Penguin Magic gift certificate. You can spend it on anything you like at Penguin, just like cash. Just complete your order as normal, and within seconds you'll get an email with your gift certificate. Kenton Knepper LIVE (Penguin LIVE) One of the world's best mentalists and cold readers came to Penguin for a MASSIVE 2-hour live event. SUPPORT LIVE MAGIC. DOWNLOAD THE FULL LECTURE TODAY. 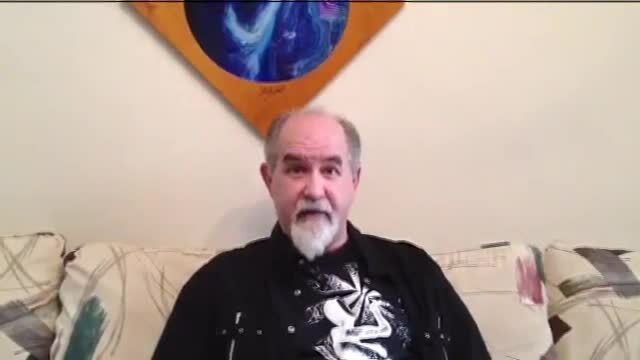 If you don't think you know who Kenton Knepper is yet, just ask Jeff McBride, Eugene Burger, Larry Becker, Bob Cassidy, David Blaine, Derren Brown, Jay Sankey, Banachek, Luke Jermay, Keith Barry, Paul Harris, Docc Hilford, Doc Eason, Johnny Thompson, Gerry McCambridge, Richard Osterlind or countless other names in mentalism, magic and television who are on the cutting edge. 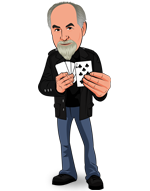 Kenton Knepper has had an influence in nearly every phase of mentalism and magical performance. If youve never been to a magic lecture, theres never been a better time. Sunday December 2nd at 7:00pm, were live-streaming Kenton Knepper in a spectacular 2-hour interactive online lecture. Watch, ask questions and learn things you won't find in any book or DVD. Purchase the Kenton Knepper LIVE product. This is your ticket. On Sunday, December 2nd, anytime before 7:00pm Eastern, click the MyPenguinMagic area at the top of the Penguin site. Youll see the livestream appear 1 hour before showtime. At 7pm sharp, Kenton will hit the stage and begin his JAM-PACKED professional lecture. Ask Kenton Knepper questions and discuss the tricks DURING the lecture. For the past year I’ve been studying mentalism, in particular Banachek and Richard Osterlind. I’ve learned a great deal from these two masters, and was really looking forward to also learning from Kenton Knepper. I made the decision to purchase the downloadable lecture based on the positive reviews, and have to say I was really disappointed. There were several good effects in the three hour lecture, but the majority of the effects left me flat, as did Kenton’s performance style. When I watched Banacheck’s PSI series DVDs for the first time, I had many jaw dropping moments where I was blown away, saying out loud, ‘WHOA! How’d he do that? !’ Same with Osterlind’s Easy to Master Mental Miracles (in particular DVD #1). But I didn’t have a single ‘WOW’ reaction to any effects in the Kenton Knepper lecture. Clearly there are people who really like Kenton’s approach, but this lecture did nothing for me. Based on Kenton Knepper’s reputation I expected so much more from this seminar. Take it from an NLP trainer: he’s not teaching or using NLP at all, nor does he accurately describe its development or usefulness for magicians. His routines are juvenile, his attitude is smug and overall, his mentalism is weak. Learn from my mistake and skip this one, you won’t miss it. Kenton's work resides in the realm of presentation, rapport, influence, and indirection. You won't find any knuckle busting effects or any complicated sleight of hand. If that's what you are looking for then, respectfully, this is not for you. If you are looking for out of the box thinking, "Why didn't I think of that?" effects, and ideas on how to build quicker rapport and relate to your audience, then this might be what you are looking for. The easiest way to find out is to utilize the Penguin search bar above. Type in "Kenton Knepper", and browse his works. If any of his products interest you, this is along the same lines. But think about this: Where else can you get a *3 hour* lecture based on DECADES of experience for about the same price as a 25-60 minute DVD that only teaches 1 or 2 tricks? This is the first time I've seen Kenton live but I have reviewed many of his products for The Linking Ring, The reviews have always been "Highly Recommended" and this lecture was no different. It was truly a chance to sit at the feet if the master and learn directly from him. Like his books,he taught many tricks but the real value is in the thinking behind them and the concepts used. If you just do the tricks exactly as taught in the lecture you will get more than you paid for, but the real value is in the thinking behind the tricks. If you apply those principles to your magic you will get far more than you paid for whether you are a magician or a mentalist. Listen: they don't get a lot better than this when it comes to lectures. In this three hours and change long celebration of the impossible, you'll learn a ton of mind-blowing material that's been crash-tested on real audiences and honed to perfection over the course of a lifetime of performances. 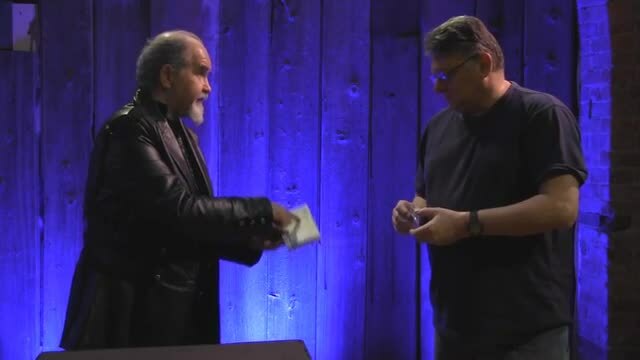 You'll also hear one of the very best in the business (Kenton's kind of a legend in magic and mentalism) discuss theory, structure...and so much more. This lecture is incredibly underpriced given the impact this material has on audiences --- so do yourself a huge favor and download it now. You'll be thrilled you did. There's a lot to digest...and all of it's absolutely superb! Absolutely fantastic. This lecture is pure gold and well worth much more than what is being charged. Very practical, easy to do effects and for those so inclined a good measure of the psychological subconscious subtleties from dual reality to cold reading for those who love performing. This lecture is jam packed with items for magicians and mentalists whether you do street, close-up, parlour or stage. Don't overlook the simplicity and subtlety of this material. Get this before it’s gone. Mr. Knepper has a way of working a lot into his talks and presentations. What may fly past as "an aside" may in fact hold mountains of gold for you to find and mine. A lot of what was shared can serve as a springboard into free thinking about creating and presenting your own personalized versions of these amazing effects. And effects? Kenton gave us everything from a bulletproof torn and restored card to a tossed out deck presentation that goes way beyond the usual card revelation and just a taste of the really "out there" effects that he is known for in the inner circles. I will watch this one over and over with tools in hand. This really is one of the only lectures I've gotten that compares to how incredible Peter Turner's Lecture was and here is his inspiration! Its worth the price in the first 20 minutes and from then on its just getting ridiculously worth your time. If you liked Peter Turner, you'll like the theory imbedded in this, the commercial material in this, and the mindset you leave your spectators with. Get this. If you enjoy mentalism you will love this. Chock full of ideas and workable mentalism. It will require multiple watchings and additional material from Kenton. This lecture is amazing and rare. Kenton is one smart cookie full of fantastic thinking on presentation and magic. The first effect blew my milnad and it just got better from there. If you want to truly connect with your audience and make the experience as real as possible, listen to Mr. Knepper! The theory he covers Is the goods you need. But the effects are fantastic as well. From a simple sugar vanish to some of the smartest thinking with cards, to drawing duplications. All useful work. And get wonderwords, it will make you a better entertainer.